The True Handleless Design of the Richmond Grey Oak kitchen builds on all of the modern, loft-living style of it’s sister kitchen by replacing the edges created by traditional handles with our True Handleless system. 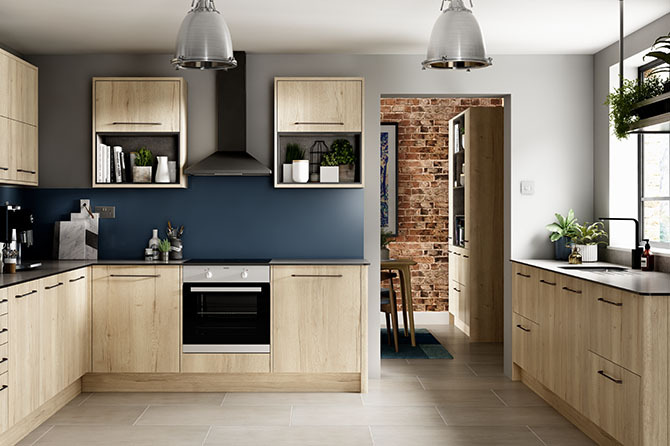 This True Handleless kitchen is for those with an eye for the finer details, taking a modern style and enhancing it with clean lines and handleless drawers & cupboards; all of which open with just a gentle push, and come with a soft close feature. If you’re interested in a sleeker version of the Richmond Grey Oak kitchen with cleaner lines, please book a free design consultation or home survey using the buttons below.